At the 2009 International Transport Economics Conference Bruno De Borger, Erik Verhoef, and I were having dinner, Erik raised an interesting question about the use of statistical value of life in evaluation studies. Suppose there is a road improvement which will save 1 life per year, reducing the number of fatalities from 2 to 1 per year (out of 1000 people using the road). Assume all travelers are identical. What value of life should be used in the analysis? Normally, we would do the equivalent of trying to compute for each traveler what is the willingness to pay for a 50% reduction in the chance of death by driving (from 2 in 1000 to 1 in 1000), and multiply that by the 1000 people whose chance of dying is reduced. An alternative approach is to figure out the willingness to pay for the driver whose life is saved. So how much would you pay to avoid dying (with certainty) (i.e. what is your Willingness to Pay)? The answer to the first question is usually taken to be all of your resources (you would pay you everything so I won’t kill you). Alternatively how much can I pay you to allow you to let me kill you (Willingness to Accept)? The answer to this second question is: I would have to pay you an infinite amount of money in order for you to let me kill you. Both of those sums of money (everything or infinity) likely exceed the willingness to pay to reduce the likelihood of dying with some probability, multiplied by the number of people experiencing it. In economic terms, we are comparing the area under the demand curve (the consumer’s surplus) for life (which has a value asymptotically approaching infinity as the amount of life approaches 0 (death approaches certainty) for a single individual, with the marginal change in the likelihood of survival multiplied by all individuals (i.e. the the quadrilateral between the y-axis of price and the same demand curve, between Pb and Pa) which describes the change in price for a change in survival). On the one hand, using the marginal change for everyone rather than total change for the one person whose life is saved, we will give a lower value to safety improvements. On the other hand, the value of life to the individual himself is much higher than the value of life of that individual to society at large. I think in practice we have to discount future lives, if the discount rate were zero, then we should do nothing for the present as the infinite future would dominate any calculation. I am dubious health inflation will continue unabated. The discussion on the article is interesting and worth reading. “While most automakers try to fix the problems with today’s tech, Volkswagen is working on tomorrow’s. The future of driving, in major cities at least, is looking more and more likely to be done by high-tech computers rather than actual people, at least if the latest breakthroughs in self-driving vehicle technology mean anything. Internet search engine giant Google has logged some 140,000 miles with its self-driving Toyota Prius fleet and Audi has had similar success with its run of autonomous cars. Now Volkswagen has presented its ‘Temporary Auto Pilot’ technology. 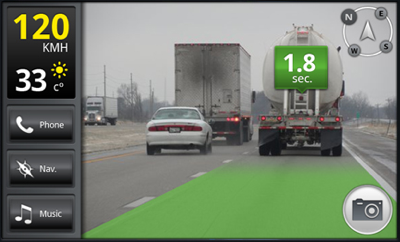 Monitored by a driver, the technology can allow a car to drive semi-automatically at speeds of up to 80 mph on highways. It works using a combination of existing technology such as adaptive cruise control and lane-keeping assist, rolling them all into one comprehensive function. Nonetheless, the driver always retains driving responsibility and is always in control, and must continually monitor it. In this way, Volkswagen only sees it as a stepping stone towards what seems like an eventual future where nobody will be doing any driving. In the semi-automatic driving mode, the system maintains a safe distance to the vehicle ahead, drives at a speed selected by the driver, reduces this speed as necessary before a bend, and maintains the vehicle’s central position with respect to lane markers. The system also observes overtaking rules and speed limits. Additionally, stop and start driving maneuvers in traffic jams are also automated. The good news–or bad, depending on how you look at it–is that compared to the more advanced autonomous driving technologies, Volkswagen’s latest Temporary Auto Pilot is based on a relatively production-like sensor platform, consisting of production-level radar-, camera-, and ultrasonic-based sensors supplemented by a laser scanner and an electronic horizon. “The State of Nevada just passed Assembly Bill No. 511 which, among other things, authorizes the Department of Transportation to develop rules and regulations governing the use of driverless cars, such as Google’s concept car, on its roads. As Stanford Professor Ryan Calo notes, this is a big step forward in ensuring that safe, driverless cars become a reality. The builder is MTR Corporation of Hong Kong, the part-privatised company that runs the territory’s remarkably efficient and clean metro system (pictured). That MTR also owns a huge property portfolio is almost certainly a core issue in its involvement with Shenzhen. Back in 2004, as part of a strategic effort to expand beyond Hong Kong, MTR commissioned a report from a local university on transit systems in many of the world’s largest cities, which observed that “railway investment is not financial viable on its own.” Not long after MTR’s founding in 1975, the parsimonious colonial administration which then ran the territory came to a similar conclusion, and decided to finance the construction of a subway system through simultaneous grants of adjacent property. It was, in essence, a trade of movement below for land above, a model that has been used successfully in Japan and, a century ago, in America as well. The results have not been entirely successful. Some of the MTR projects reflect the worst of bleak government architecture but over time its portfolio has become a bit smarter; and these property holdings, along with the lease of advertising space, now account for more than 60% of MTR’s revenues and presumably all of its very healthy profits, as well as providing the financial strength to support its spotless metro service. Value Capture needs to be used more in the US. 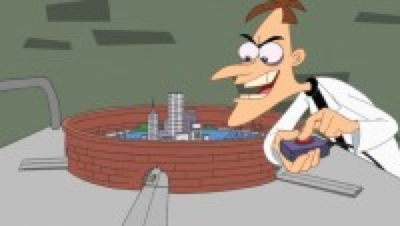 In this case Doofenshmirtz is being “evil”, following the “enclosure” movement of earlier times (see also The Transportation Experience), but in this, enclosing an entire metro area for the purposes of raising toll revenue (profits). No new value is being created, in fact value is being destroyed as wealth is transferred and an otherwise useless wall is constructed to ensure excludability. (Unless there was a congestion problem, and Doofenshmirtz uses time of day pricing to manage demand, I just suspect this is unlikely). In this case, he is adding value to the world (from a transportation perspective), and needs the revenue to pay back the Research and Development costs of the Drillinator, leave aside the operating and construction costs. This seems not terribly evil, but perhaps unsound. Doofenshmirtz: Ah, Perry the Platypus! Your timing is impeccable. And by impeccable I mean: COMPLETELY PECCABLE! [Laughs] Your just in time to witness my latest scheme. Behold, my Drill-Inator! I will bore a tunnel to China, build a toll highway, and make millions! Doofenshmirtz: The molted lava of the earth’s core completely slipped my mind.